CON-CRÈT is for men and women looking to enhance workout performance. 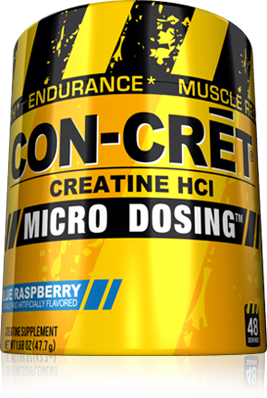 CON-CRÈT helps promote muscle growth, build lean muscle, improve endurance, and accelerate muscle recovery. Directions For CON-CRET: RECOMMENDED ADULT USE: As a dietary supplement take 1 hour prior to training with approximately 4-6 ounces (118-177 mL) of water or juice. CON-CRET can be taken on an empty stomach or with food or mixed with protein. Normal Training: 1 serving per 100 pounds of body weight. Intense Training: 1-2 servings per 100 pounds of body weight. Off Days: Can take 1 serving per 100 pounds of body weight to assist in muscle recovery.